This is a good frog to have in your pocket if you want to drop acid and dance under a black light. Scientific American reports that this freaky frogger has been hiding in plain sight. The South American polka dot tree frog is pretty average looking for a small semi-aquatic animal, but when the UV spotlight turns on, they’re ready to party. 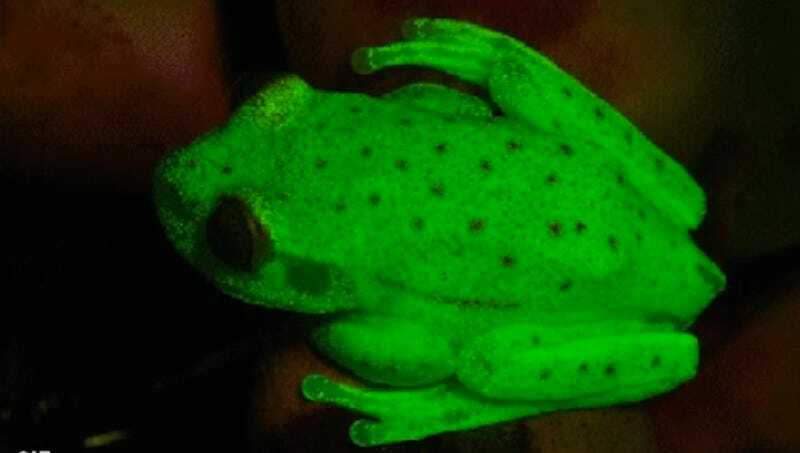 There are three very special molecules in their lymph tissue, skin and glandular secretions (yum), Hyloin-L1, hyloin-L2, and hyloin-G1, which create green luminescence, which is very rare in terrestrial animals and “unprecedented” in amphibians, NPR reports. Researchers shone a light on these critters expecting them to glow red, as their skin contains a pigment called biliverdin, which produces a red luminescence. Nature reports that the scientists were stunned when the tree frogs turned blue-green instead. “We couldn’t believe it,” said study co-author Julián Faivovich. NPR reports that another co-author, Norberto Peporine Lopes, posits that looking at one another’s glowing bodies “is particularly exciting to the frog’s eyes and likely helps male frogs to signal to female frogs where they are in order to “coordinate the attraction.” Now that definitely sounds like a dance floor to me.